For me, September, means welcoming in the fall. I've decorated the house and I'm reading to do some fall activities with the boys. 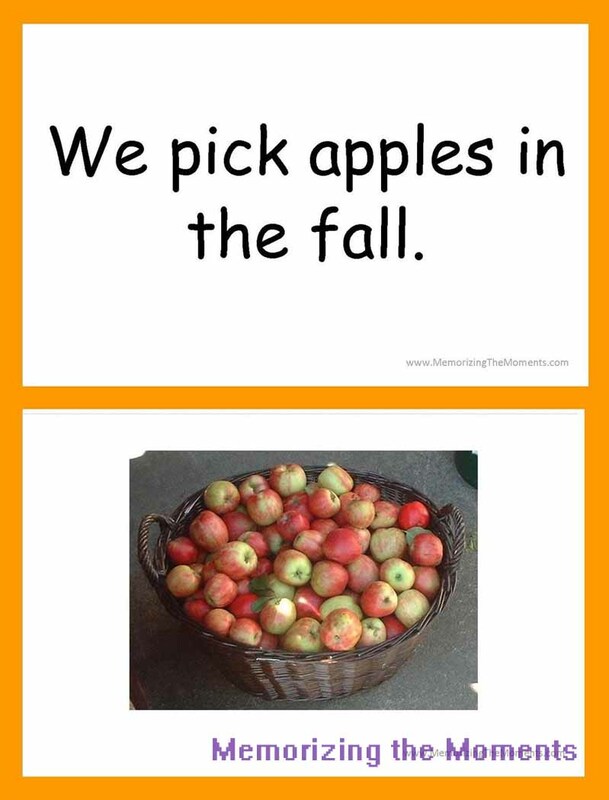 Recently I added a section for early reading books to the blog, so I decided to make a fall themed book. I am making three version of each book, one in English, one in Spanish and one with both. I am still kind of playing with it to see which ones I will print. This time I printed the Spanish only version. 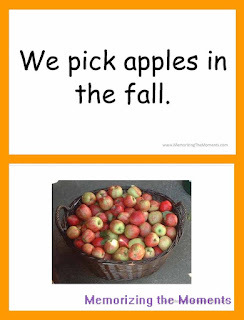 If you're looking for other Fall resources, you might check out my 3 Part Fall Vocabulary Cards. 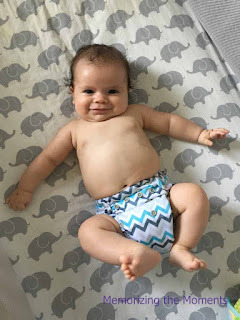 Generally I mostly share about our Early Education Journey, but I figured sharing about our Cloth Diaper Journey might be helpful to other mamas too! It is definitely a subject I've searched the momsphere for! With Xander, cloth diapers were not even on my radar. I didn't know they really existed anymore. Then I started teaching environmental science. I think that is one of those subjects where the more you know, the harder it is not to care. I started looking for ways to reduce my environmental impact and cloth diapering popped up, among other things. 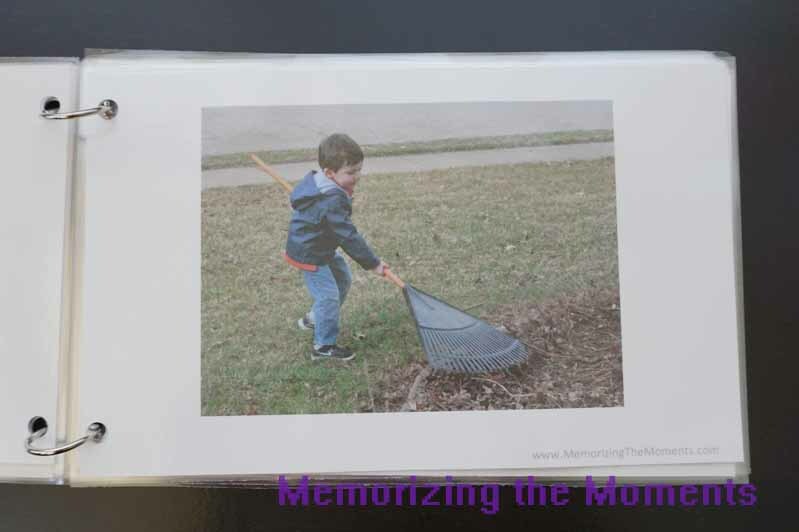 At first I was envisioning folding and pinning and all kinds of work. The idea of all the extra pee and poop was definitely a deterrent, but I figured I should at least explore the option. When I was pregnant I looked into all the different kinds of diapers and shells and inserts. Luckily, my background in education prepared me for all of the acronyms! I bought a couple of styles used to try out and then kind of forgot about it until Archer was born. Based on lots of advice I read, I knew I didn't want to use cloth with a newborn. They are so little they have to have a special size, they go through a gazillion diapers a day and we were given lots of newborn diapers for our shower anyway. Then as he got a bit older, carrying the garbage bags full of smelly diapers outside just made me sick to my stomach. 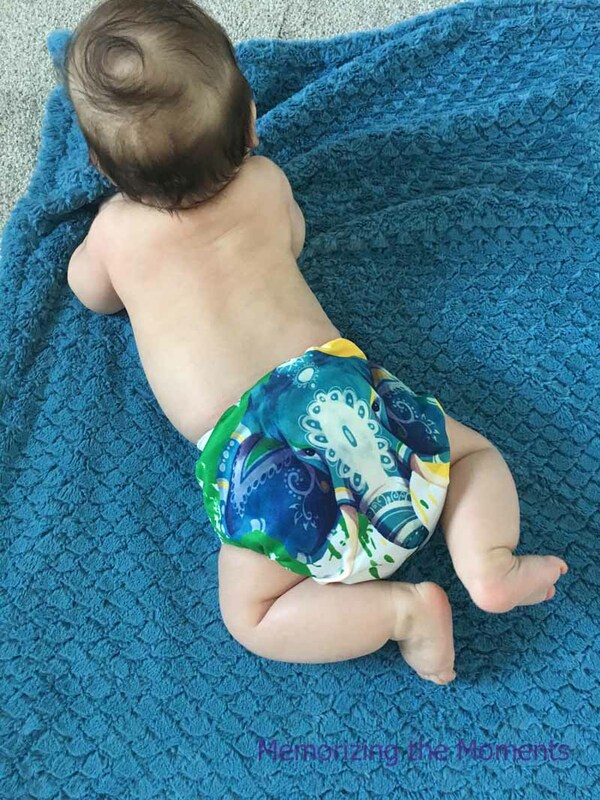 I hated the idea of that much waste just sitting around in a landfill for years to come (even "biodegradable" diapers cannot break down under most landfill conditions). I did a little more research, joined a couple of webgroups and got some encouragement from a few friends, and decided to try. Well, we've been in cloth, other than nighttime for over a month now. Here's what we have learned. Try multiple kinds! I started out thinking that covers and inserts were the way to go. What I thought I'd like best, I hated. What I thought I'd hate, I ended up loving. (More details about which of ours I like/dislike below. It is easier than thought it would be. You have to figure out what kind of diaper you like and your wash routine, but it is pretty simple. Since Archer spits up like crazy and I do laundry daily anyway, it really didn't add that much laundry. 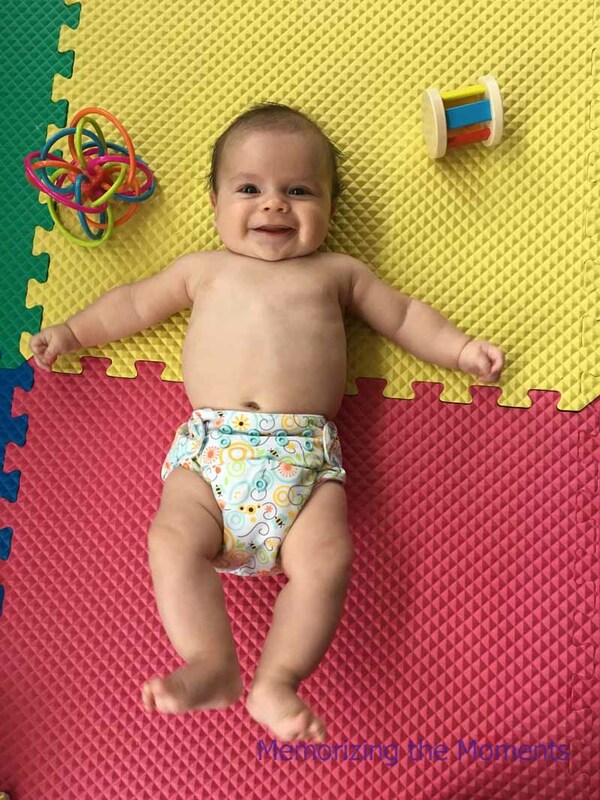 I currently have enough diapers to wash about every other day, and am hoping to expand that. The pre-wash is diapers alone, but the main wash can include all my other regular small laundry, which cuts down on the number of loads. It doesn't have to be all or nothing. I am allowing myself some flexibility. We have some leftover disposables that fit, so I use those if someone else is watching him. I also use disposables at night still, because he is still waking up enough that I usually change diapers in my sleep. We also plan to take disposables on vacations. Not making myself be perfect, makes it much more manageable, so it is easier to continue. Overall, I figure that's still less waste in landfills. It may become addicting. I had no idea they'd be so cute! For a boy mom who doesn't get hair bows and nail polish, it has been so much fun looking for cute diapers! I'm a little sad the weather is changing and I'll have to cover them up. For those of you on your own journey and wanting to know more about the kinds, here's my opinion on what we've tried. Covers and inserts - I thought I'd like these the best. The idea is that you have a waterproff outer cover and then absorbent inserts. You change out the inserts as needed, but can reuse the cover multiple times until it gets soiled. They're the cheapest and require the least prep. However, the two brands of covers I have are a little bulky on him (granted, I know he'll grow). What I really ended up not liking was having the wet insert sitting right against his skin. I felt like they were just holding the pee on him. AIOs - These are diapers are supposed to be the easiest. They have everything in one piece. It is less cost effective than covers, because you change the whole thing every time. Also, changing absorbency is hard. I have two brands, Bum Genius Freetimes and Imagine All-In-One Snap Diapers. The Bum Genius have flaps of inserts sewn in but can still fold out, so that they clean and dry easily but do not require stuffing. Right now, they're a little big and bulky for Archer. However, as he grows, I think I'll like them a lot more. The Imagines are a little smaller, so fit him better. Actually, I've already let out all the rise snaps, so am not sure that they'll fit him as he gets much bigger. They have an insert that snaps into place (so I'm not really sure if that is a true AIO or not). They seem to absorb just fine, but the inside kind of looks worn and shaggy already. I use them in my rotation, but don't absolutely love them. Pockets - These are a shell that looks like a diaper, but has a pocket that you stuff with different kinds of inserts. Once they are stuffed, they function like an AIO or regular diaper. Once again, pockets less cost effective than covers, because you change the whole thing every time. I thought I would hate these because I didn't want to spend the time stuffing pockets and I'd need a bunch. After using them, pockets are my favorites. I felt like I got a better fit with them. The pocket also lets you add extra inserts or use different materials to adapt to your baby's needs. Plus they are SUPER CUTE! I call them the mommy equivalent of trading cards. I tried Kawaii, Alvas and Mama Koalas. Kawaii was the first diaper I tried when we made the switch and it was a disaster. There was poop EVERYWHERE. Something about the way they are shaped, I cannot get them to fit around Archer's legs. Needless to say, we do not use them anymore (to be fair, there are some people that love these diapers). The Mama Koalas ended up being my favorites. They fit Archer the best, but only have two snaps on each side, so go on pretty easily. 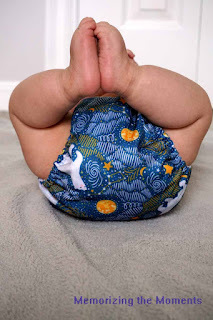 Unfortunately, they are a growing company so have limited diapers available at any one time. When I decided they were the ones I liked, I had trouble buying them in boy friendly prints, so ended up supplementing my stash with Alvas. Alvas are just a little bit taller and have three snaps instead of two. They fit well and will probably fit longer on a bigger baby. We still occasionally have a few kinks to work out, but my intention is that we'll be able to stick with cloth until Archer is potty trained (and hopefully use some of them on future children as well). I'll let you know how it goes! This page contains affiliate links, at no cost to you.